I’m Kristel Jax, I’m an artist and writer from Toronto. You might know me from Drone Therapy Podcast, the Instagram @dyingbutfine, my noise project Brigitte Bardon’t, or my writing. Or maybe you just know my mini pug Lana Del Satan. She says hi too. Until 2016 I was working as a freelance writer, then my skidillionth nervous breakdown made me unable to function/work. Now I’m just a sad goth searching for my recovery narrative from an extreme panic disorder & other accompanying terrifying diagnoses. Mental health issues are usually best dealt with via a combination of medication and talk therapy, yet the Ontario government will only pay for my medication, not my therapist — yes, there are options for free / low-cost counseling programs in Toronto, I actually made a pretty extensive list of them here, but most are short term and I’ve pretty much exhausted those options. I’ve made progress and have a lot of coping mechanisms now, but the intensity of my symptoms means I’m still struggling to hang on, never mind figure this out. To get my recovery narrative to a place where I’m functional and working full time again, I need to address the root of my trauma. I’ve found a relational psychoanalyst who’s generously offered to lower her rates for me to $40 per session (still inaccessible to me, even though she usually charges $140 per session). Your donations allow me to see her every week! Or possibly even have therapy twice a week eventually if this goes well. Before settling permanently in Toronto, I spent nearly a decade riding Greyhounds and sleeping on couches, floors, and above doors. I toured 20 countries as one half of experimental music duo Alpha Couple. 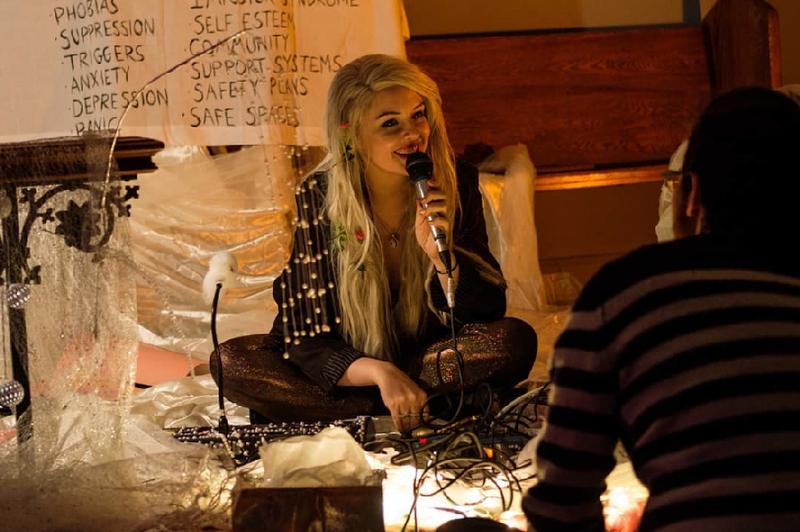 In 2010 I co-founded and curated Freud's Bathhouse & Diner, a DIY art space in Winnipeg. I used to run a micro-press for handmade books & comics. My work traces the impossibility of a single narrative by channeling the ambiguity of singular experiences and shifting perspectives in the digital era through individualized and emotion based story telling. This is a fancy way of saying I’ve turned my emotional labour into an art practice. 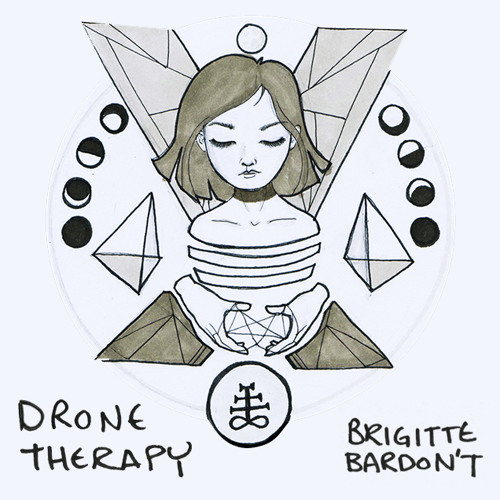 The Drone Therapy Podcast came out of my struggles to both process the deterioration of my mental health / functionality / life as I knew it and find accessible, affordable therapy: I wanted to share what I was experiencing and learning through music and humour. Humour-ish. Music-ish. 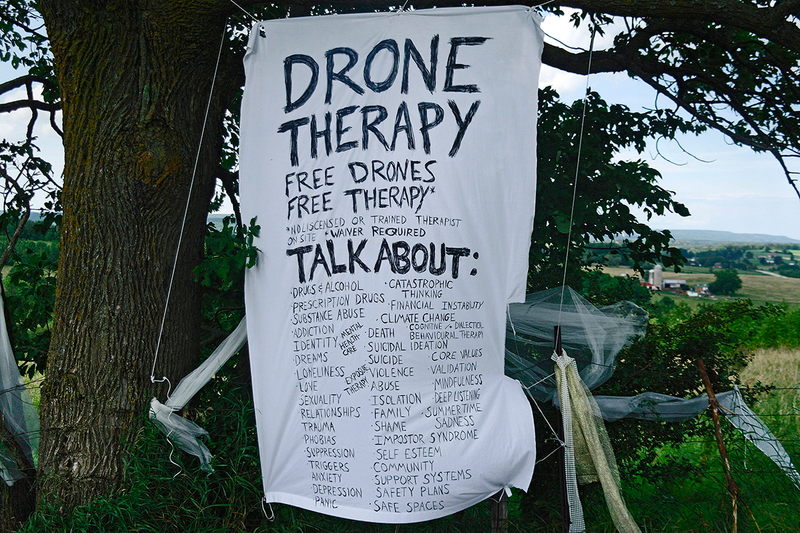 The Drone Therapy project started on Youtube and is now an ongoing podcast and occasional live interactive installation. The more therapy I go to, the more Drone Therapy there will be. Currently I'm releasing 1 or 2 podcasts per month. They're free to stream & download. 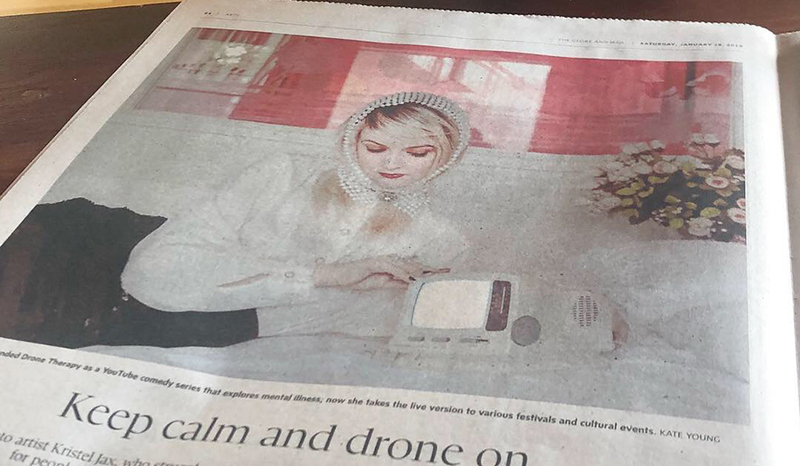 You can read a lot more about Drone Therapy here. Unable to write or focus for too long because of my condition, I started the @dyingbutfine Instagram account with two friends in October 2016 as a way to share jokes about mental health, feminism, pugs, and whatever else. We grew our following over time and now people regularly reach out to me (right now it’s just me running the account) for life advice or to say hi, which is super hecking cute. I also draw comics. ⁕ Thanks for helping keep me alive ily. ⁕ At least one of the following will be made each month only for Patreon subscribers! They will be funny. Funny-ish. I’ll accept requests but no promises. ⁕ All the $6.66/month rewards, plus I’ll make you a personalized video with Lana the mini pug about something you request I make a video about. They will be funny. Funny-ish. Maybe you want advice, or you want us to read you a Rilke passage, or you want us to sing happy birthday to your friend. Maybe you want me to talk about a meme I made a year ago or remind you to take your pills. You can do up to one request per month & I’ll post it for all Pal of Lana Del Satan subscribers using your name if you want, or make it anonymous, or even send it to you privately if you’d rather that. ⁕ You’ll also be able to see the videos other ppl request, unless they wanted ‘em private. Now that I've reached my therapy goal (ty!!! <3) your donations help me make more Drone Therapy podcasts, memes, writing, music, & pug content.